well, this is what you get when you try making a wall listening to the wall... a record I bought for 99 cents by the way lol, even though the cd is 35 bucks <_<. But, if YOU don't know where this title is from..you must DOWNLOAD PINK FLOYD!!! Daddy, what else did ya leave for me? Ooh. I really like the headshot of Alucard. The fade of the bricks is very nice too. Definitely a favorite. Wow! One of the best wallpapers I've ever saw. I really like it. I've already added it to my favorites. I've got a new pulpit background. Thanks! Wow. It definitely is... bloody.^^ But I like it. Simple and clean. And you're right, the song is amazing. You know what other song by Pink Floyd I adore? High Hopes. Can never get enough of it. yay arukard. hehehe .i still havn't seen or read the work yet. but i like the wallpaper. ^^! Ooo~ It has a simple look but it's really awesome how you set it up. The bg and the scan works well together. Not much to say. Really good work! WOW I love Hellsing, and this wallie is awsome!!! Nice transition from the white to the bricks, it looks very good. I like the simple look this wall has, and nice job on the blood. that is freaking wicked, one of the best pictures i have ever seen! wow! you rock. and so do Metallica, Pink Floyd and Deep Purple! wow. Very excellent cap of Alucard. Put on the wall very nicely. Unusually orignal. 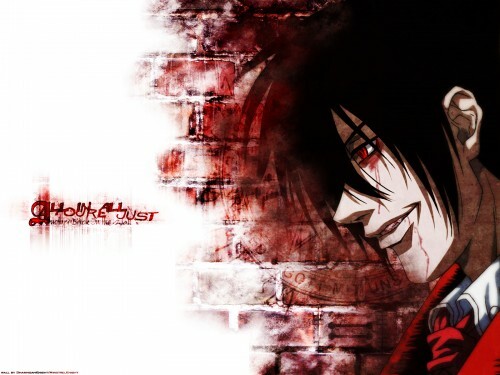 alucard wall is very nice!!! cool pick. i like your work. good job.